Burgers are tried and true, and you can’t go wrong with eating one for your next meal. They’re envisioned by many outside of the United States as the standard American food, and we within the US embrace that wholeheartedly. 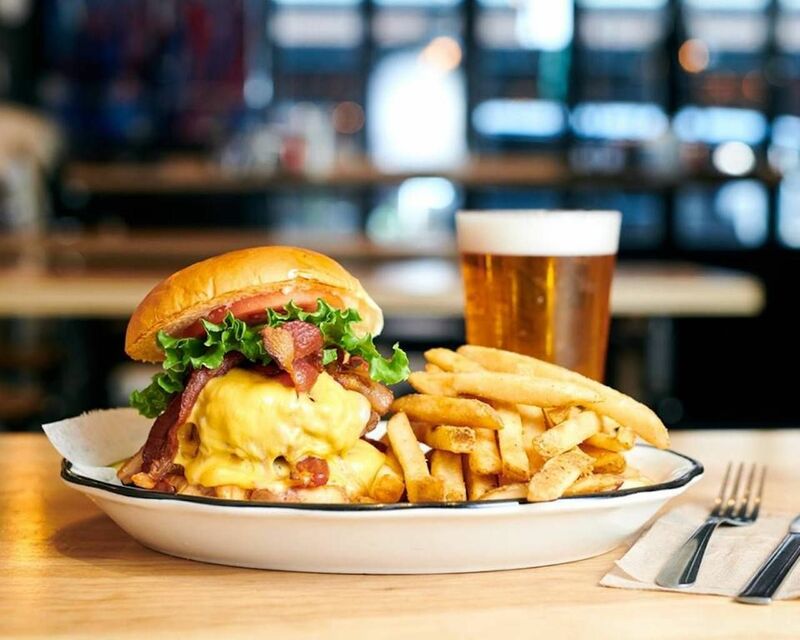 In New York City alone, you can’t walk a few blocks without passing a place that includes burgers on its menu. As the home of Shake Shack, we’d be remiss not to mention it, and while the now-international chain is delicious in its own right, there are plenty of other places that also deserve your attention. Here’s where to find the best burgers in NYC. 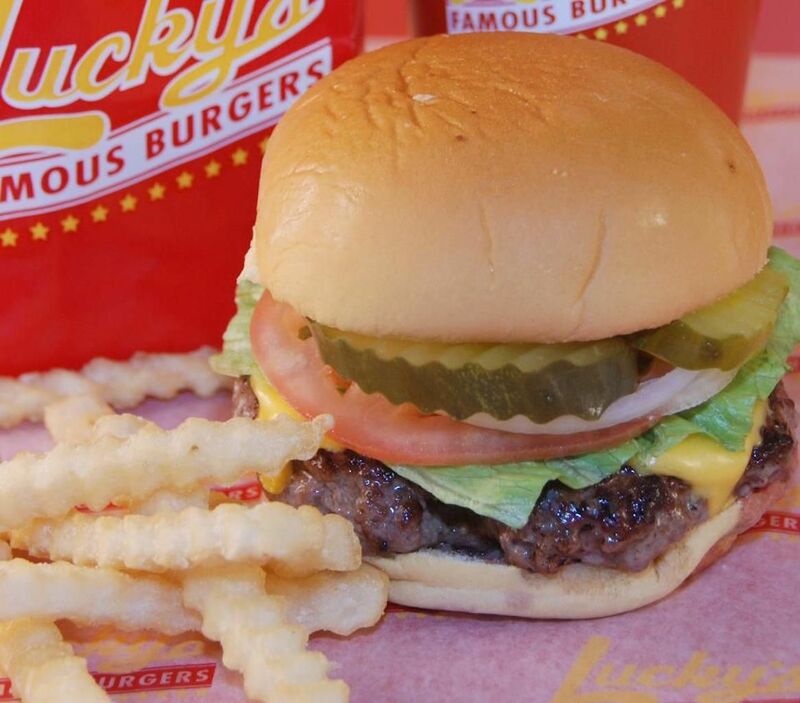 Easily missed if you’re not keeping an eye out for it, Lucky’s has some of the juiciest burgers in Manhattan. It has quick service and is decently priced, and one of the best things about Lucky’s is the option to build your own burger and have it exactly as you want; you’ll pick a patty (meat and non-meat options are available), dressings such as lettuce or a fried egg, a type of cheese if any, sauce, and bun. If the stress of trying to choose the best combination is too much, then it’s readily prepared options like the Hell’s Kitchen will do the trick. Boroughs like Manhattan and Brooklyn are getting all the credit for their growing beer scene, but with its growing number of craft breweries and tap houses, the Bronx is a rising star that won’t let itself be ignored. Housed within a casual saloon setting, the Bronx Alehouse has a long list of local and international beers. It has tapped into one of the oldest combinations ever, burgers and beer, and it does it well. All burgers are served with brioche buns and a side of fries or homemade potato chips. Every week there’s a different burger special, but mainstays are the Drunken Onion Gorgonzola (topped with house-smoked bacon, IPA onion jam, Gorgonzola crumbles, lettuce, and tomato) and the Alehouse Burger (with pulled pork, spicy slaw, and onion rings). Head up to the northern borough for your next meal and you won’t regret it. Kings of Kobe’s menu consists of only burgers, hot dogs, and fries, and everything is 100 percent wagyu beef. For the burgers, you can either order a half pound or pounder, and the prices will vary depending on which one you pick. The Queen Rules burger with prosciutto, pepper jack, lettuce, sweet chili relish, and jalapeño mayo will cost $15.35 for a half pound and $22.85 for a pound. Opt for a half pound and get a side of battered fries or BBQ mac and cheese balls. Gluten-free buns are available. Las Catrinas is a Mexican eatery through and through, from its menu to its decor. It was designed with Tulum, Mexico, in mind and brings the relaxed vibe of the beach town to the heart of busy Queens. Chef Leopoldo Tapia is from Mexico and brings authenticity to every dish. 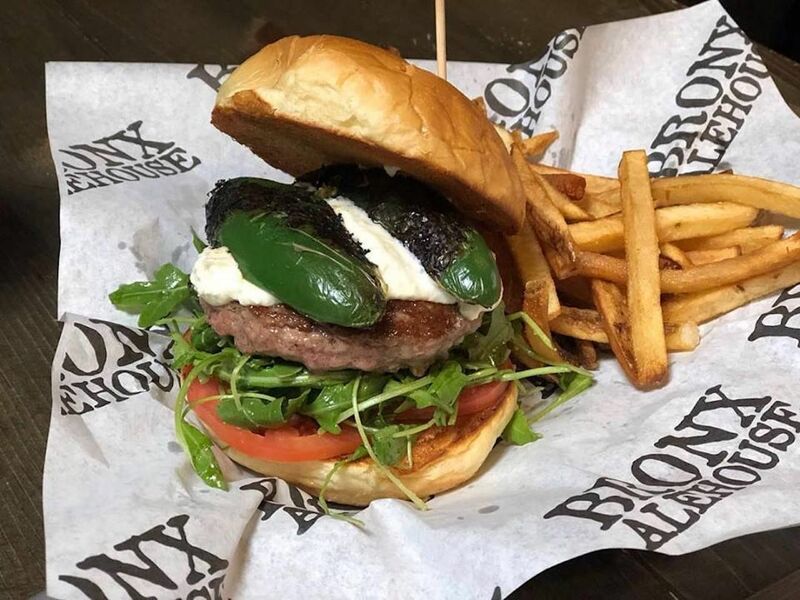 There are only two burgers on the menu, but heading to Astoria is totally worth it for La Gringa, a burger made with homemade pork and beef chorizo, cilantro, serrano peppers and parsley, quesillo, avocado, white onion, fried egg, and chipotle mayo. The drinks are great here too, so be sure to try a Blue Hawaiian or margarita with your food — or you can even ask the bartender to make you something completely unique and not on the menu. Eating contests always seem to be for those partial to meats and dairy, but this is not so at the Organic Grill. Here, vegans and vegetarians can join in on the overeating fun. Stuff your face until you can’t anymore with the “I Beat The Machine Burger Challenge.” Within a 10-minute limit, you have to eat three Green Machine burgers, which consists of completely organic ingredients such as a health bun, mushroom patty, pesto, guacamole, lettuce, and tomatoes. It costs $27 to participate ($20 if you’re a group of six or more) and you’ll win a gift certificate for the price of the challenge, a diploma, and a picture on its wall of fame. 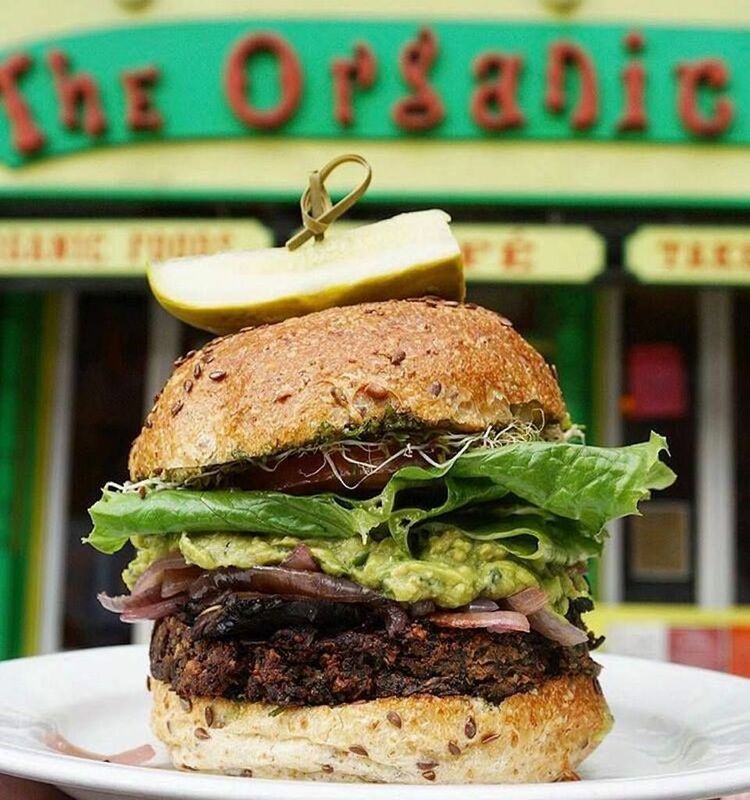 The Organic Grill does serve other foods like breakfast fare, soups, and sandwiches, but you can’t go wrong with any of its burgers — even if you can’t beat the machine. Black Tap is famous for its monstrous milkshakes, dubbed “freakshakes,” that cost $15 a pop and pack on topping upon topping. What many overlook in favor of the shakes, however, are its burgers. All made with the high-grade Pat LaFrieda meat, every burger comes with a side of fries, though you probably won’t even finish half of them because you’ll be so focused on the burger itself. For pizza lovers, there’s the pizza burger with zesty tomato sauce, fresh mozzarella, and shaved parmesan. And for those looking for something different, there’s the vegan burger with a black bean patty, vegan mayo, pickled onions, salsa verde, and cilantro. If you have room left for dessert, then opt for one of the freakshakes. We recommend sharing the Cookie ‘N Cream Supreme with a friend. Opened in 1972, Jackson Hole is a small, family-owned restaurant chain. 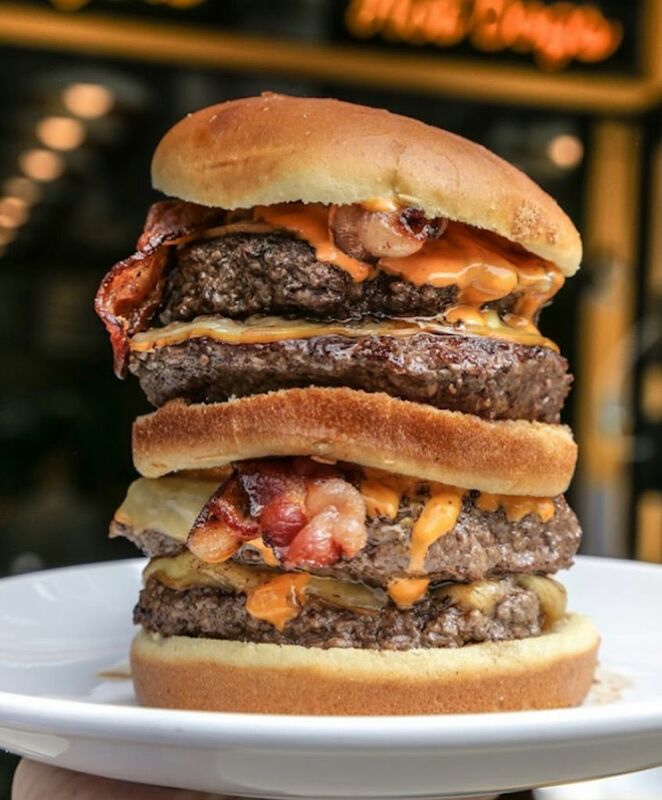 It’s known for serving up gigantic burgers that are seven ounces, and you’ll be lucky if you even get through half of the mouth-watering monstrosity. It’s even popular among celebrities with figures like former President Clinton, Jennifer Aniston, and Derek Jeter having visited. 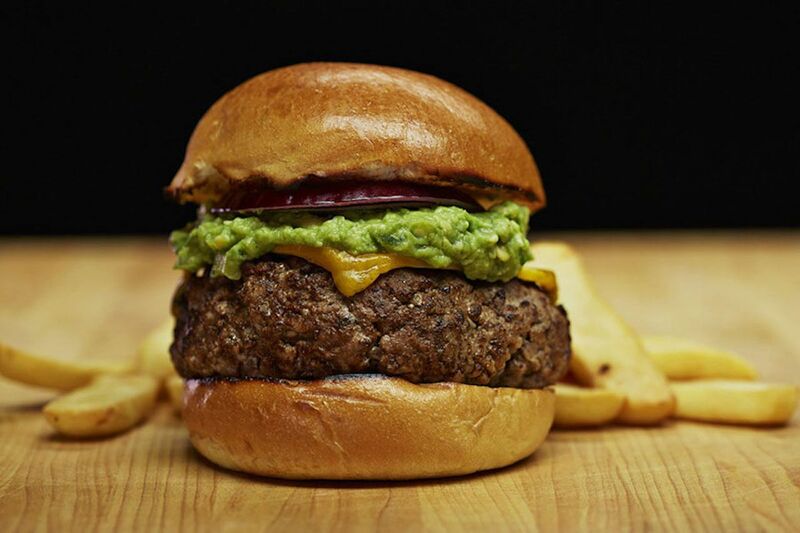 The menu has an extensive array of burgers and sandwiches, ranging from a Thanksgiving Burger to a Mexican Burger, but you might want to spring for the good ol’ classic plain burger for a chance at finishing your meal. This spot is actually located in Brooklyn despite what the name suggests. There’s a lot of history here with it being run by the same family for over 50 years before being taken over by Toby Cecchini and Joel Tompkins, who restored and reopened the bar in 2013. Cecchini is credited with creating the cosmopolitan cocktail that we all know and love today, and if you pair that with the L.I. 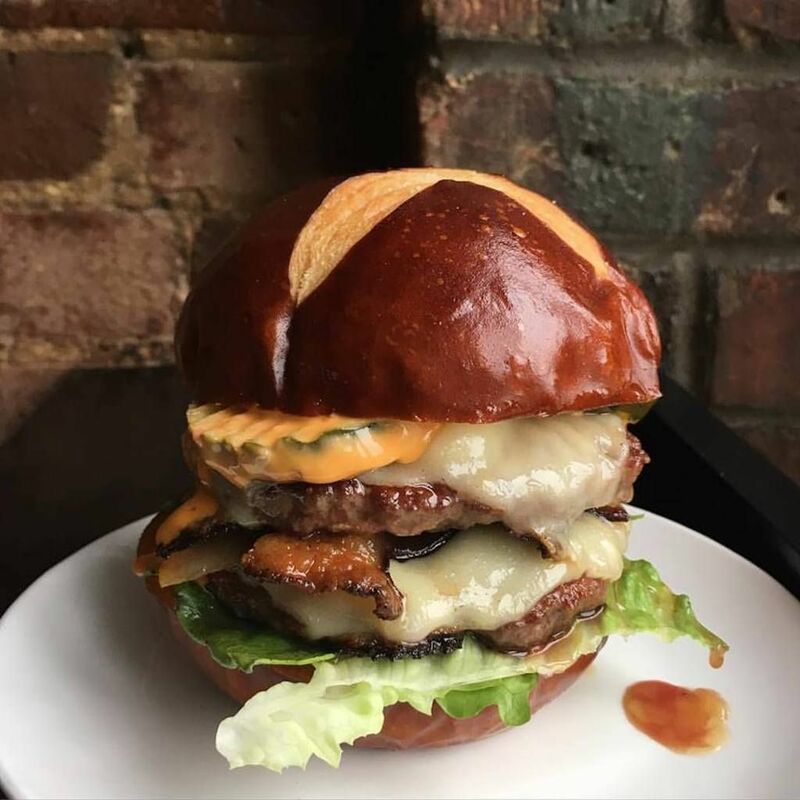 Burger, which is made up of two dry-aged beef patties, pickles, cheese, and fancy sauce, you’ll have even more to write home about. It’s also located within short walking distance of the Brooklyn Bridge Park waterfront, so head there after your meal for some pretty amazing views of the Manhattan skyline. Emmy Squared is primarily known as a pizza restaurant serving Detroit-style deep dish, and it does it well. But what you really want to pay attention to here is the sole burger on its menu. Named “Le Big Matt,” it consists of double-stacked Pat LaFrieda grass-fed beef patties, American cheese, greens, pickles, and Sammy sauce, all between two pretzel buns; it also comes with a side of waffle fries. It’s messy and pricey at $25, but you’ll definitely be getting your money’s worth. The original Minetta Tavern, back then named Minetta Brook, opened in 1937. It was frequented by the likes of Ernest Hemingway, E.E. Cummings, and other notable figures from all walks of life. Now, it’s located in Greenwich Village and is a fusion of French and American tastes, with the decor being reminiscent of a French bistro and the menu looking like that of a steakhouse. The prices are nothing to scoff at, but the quality and taste of the food here really makes it worth your while. 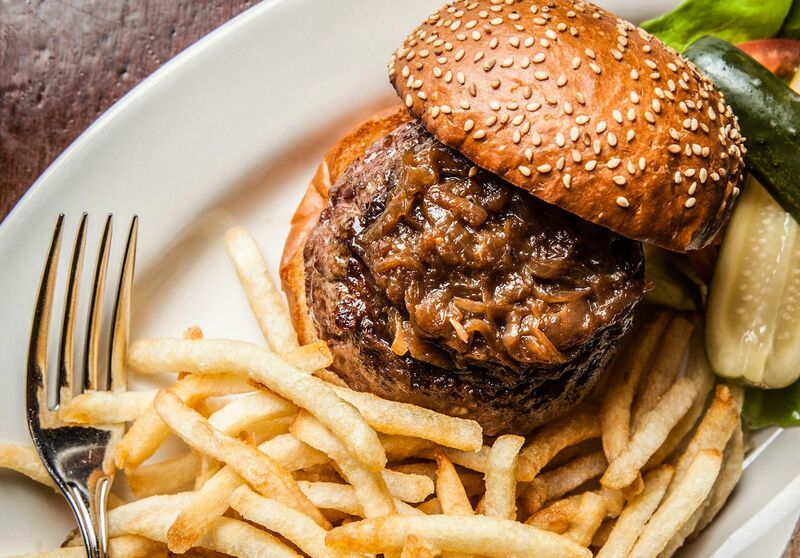 One of the most well-known menu items here is the Black Label burger, which uses a selection of prime dry-aged beef cuts in its blend, with caramelized onions and fries.